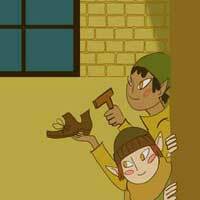 Kindness begets kindness -- plus several hours of free elf labor -- in The Elves and The Shoemaker, a fresh musical adaptation of Grimm's fairy tale. A poor-but-kindly cobbler is in a tight fix. After giving away his last pair of shoes to a deserving soul, he has only enough leather to make a single pair more. Exhausted, he heads for bed, but not before setting out his materials for the next day's work. That very night, mysterious elfin visitors creep into his shop on a special mission to help. This charming production from Keegan Theatre puts a humorous spin on the popular classic and keeps the spirit of the holidays alive.